Ainokura (相倉合掌造り集落) is one of Gassho Style House Residence in Gokayama. It is registered in UNESCO World Heritage Site. There are 20 remaining Gassho Style Houses in Ainokura. Most of them are 100 to 200 years old, and some of them are over 400 years old. There are several Hotels which you can stay at Gassho Style houses. 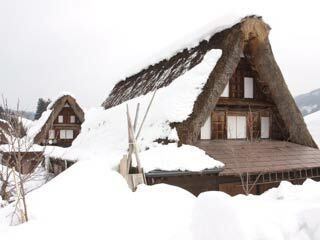 Also, two of Gassho style houses are opened as the local museum. There is public bathroom at the parking. Most of the Gassho Style Houses are private properties, and people still live in the house. There are about 60 people live in this residence. Ainokura is chosen as two star spot by Micheline Green Guide Japon. There are 8 hotels and 4 restaurants. 1. No smoking in this area. Smoke only permitted place. 2. Don't enter sideways, gardens and farms. All of them are private properties. 3. No car entry. Give away for local cars. 4. Never visit this area too early in the morning and at night. 5. Bring your trash with you, and leave nothing here.